Viewed thirty years on, Richard Donner’s demonic classic remains one of the finest horror movies to have been put out by a mainstream studio. It helps that the movie has such a simple, effective central premise. When high-flying politician Robert Thorn (Peck) learns that his child has died during birth, he decides to accept an invitation by a cleric to pass another newly-orphaned baby off his own – his wife Katherine (Remick) “need never know.” Five years later and Robert, Katherine and the floppy-haired moppet Damien are all happily settled into a new life in London. But when a bonkers-sounding priest presents him with dire warnings of an imminent Armageddon and people around him start mysteriously dying, Robert comes to realise that Damien may – gasp! – actually be the son of the Devil. 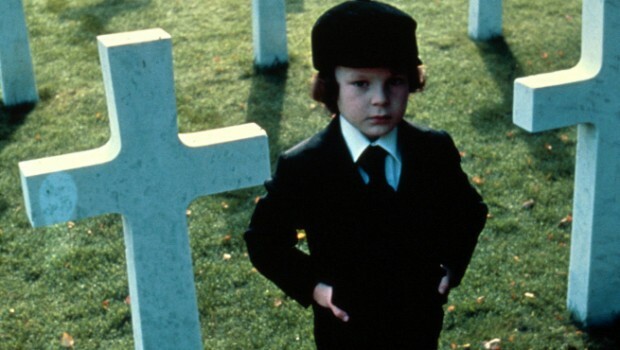 The Omen withstands the cruel paws of time for several reasons. Firstly – and crucially – is the cast. We don’t learn a great deal about Peck’s character, yet his wrinkled brow and stoic manner tell us all that we need as we watch his politician’s regimented life slowly unravelling. Just as impressive is Remick who, in a difficult role, goes from doting on her son’s every word to being utterly terrified of him. And then there’s the supporting cast – Billie Whitelaw’s measured, unsettling study in creepiness as the boy’s nanny; the great David Warner as the shifty-looking photographer who helps uncover the truth about Damien; and, of course, Harvey Stevens as Damien himself who makes for an effectively sinister kid (just look at that fringe). The Omen is also marked out by its succession of gory and excellently-choreographed set pieces. If it’s been a few years since you last watched The Omen these are the bits that you’re likely to remember – death by impaling, death by beheading, death by hanging…each one of them delivered with a gleeful aplomb by director Donner (in the film that made his name). Despite the gore this is no cheap exploitation film though. No, this is a well-crafted big-budget horror for adults. And from the isolating enormity of the Thorn residence to Jerry Goldsmith’s operatic score there is always the sense that this is a movie that everyone involved in has taken great care to get right – a classical picture as involving as the very best Hollywood melodrama. Okay, so The Omen isn’t as terrifying as it may once have been. But with its word-perfect script and attention to detail it’s proof that a horror movie can be about much more than cheap shocks. We don’t even need to mention the recent entirely pointless remake, right? The film is also available in a snazzy-looking ‘Omen Pentology’ set for fans. Along with the remastered original movie it includes the entertaining first sequel Damien: Omen II (Damien as a troubled teenager); the so-so The Final Conflict: Omen III (Damien enters politics); the reasonably woeful made-for-TV Omen IV: The Awakening (the devil reborn as a girl) and the bland recent remake.